Conductive Keratoplasty, better known as CK uses radiofrequency (RF) energy, instead of a laser, to reshape the cornea and help patients with near vision and reading. Although not specifically FDA-approved for treatments of keratoconus and after other eye surgeries, it can be selected by the patient and surgeon as an “off-label” procedure if appropriate. The CK procedure is performed using a small probe that releases radiofrequency (RF) energy. After application of a topical anesthetic (i.e., numbing eye drops), radiofrequency (RF) energy is applied in a circular pattern to shrink small areas of corneal tissue. This circular shrinkage pattern creates a constrictive band (like the tightening of a belt), increasing the overall curvature of the cornea. 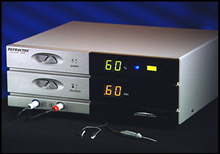 The use of RF energy is one of today's most advanced surgical techniques. In addition to its use in CK, RF technology is being used in prostate cancer therapy, back surgery, even cardiovascular procedures. For the keratoconic patient, CK applications may help reduce astigmatism and center the keratoconic cone. It may also help decrease the cone in some cases. CK may also be used in conjunction with the Intacs procedure. COMBINED INTACS/CK PROCEDURE: At the CLEI Center for Keratoconus, we are working on innovative approaches to treating keratoconus. We have found that, in some cases, Intacs can be combined with the Conductive Keratoplasty (CK) procedure. In combination with Intacs, or performed after the Intacs suture is removed, CK may allow for better reshaping of the keratoconic cornea. In fact, we were the first to perform this combined procedure in the U.S. We will discuss this with you if we think you are a good candidate for Intacs/CK combined surgery. Before CK, of course, a complete keratoconus examination with Dr. Peter Hersh is necessary. The CK procedure itself is comfortable. There may be a dry eye or foreign body sensation for a day or two afterwards. Once finished, you don't have to wear a patch and can usually return to work the next day.